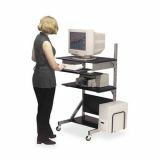 A versatile compact workstation, the Alekto is ideal for smaller or space limited work areas. 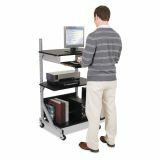 Height adjustable (27.5" to 52.5") flexibility allows use as either a stand up or sit down workstation. 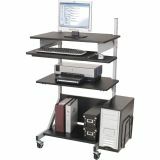 Shelves are interchangeable, allowing the retractable keyboard shelf to be mounted high or low. The retractable keyboard shelf includes a pull-out left- or right-handed mouse platform. 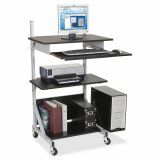 MooreCo Alekto-3 Totally Adjustable Workstation - Alekto Workstation allows you to sit down or stand up, reconfiguring it for your convenience. Top shelf adjusts in height from 27 to 52" in 2" increments. Cable management tray assembles on either laminate shelf. Interchangeable CPU holder will fit on right or left side. Retractable keyboard with pullout mouse tray is designed for right-handed or left-handed use. 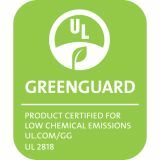 Ideal for medical or industrial facilities. 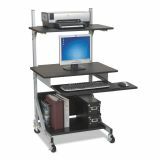 Compact design fits into small work areas. 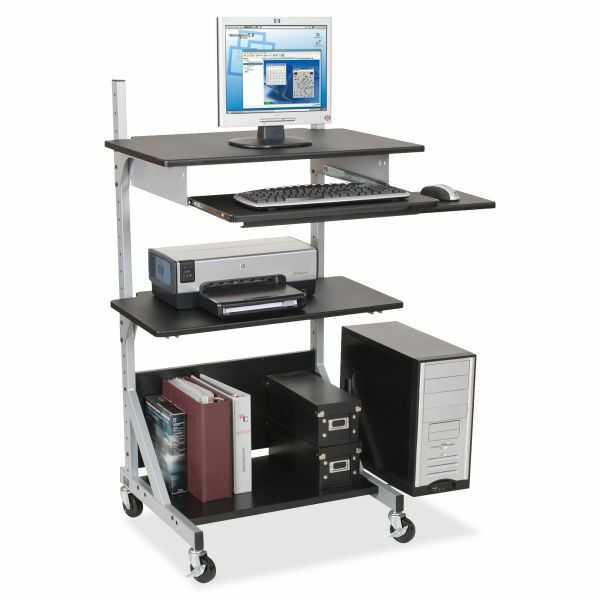 Workstation rolls large 3" casters for mobility and weighs 77 lb." Adjustable CPU holder can attach to either side of the workstation. 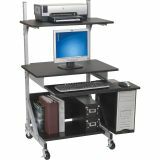 Silver powder-coated frame includes 3" casters (two locking).